Thanks to inspiration from folks like Mike Rohde and Paul Soupiset, I’ve recently found ways to incorporate writing + drawing: Sketchnoting. Dinosaurs. Little boys. Magic doors. Teleporting. These were just some of the things I wrote about as an elementary school aged kid. I don’t know how many communities and schools still host these, but when I was young, I attended many Young Authors Conferences. At these events, we learned about writing, stories, met real authors and got a chance to present stories of our own. I remember countless hours writing, and illustrating, my books. I remember my dad taking me to work with him on a Saturday or two, and sitting in an empty office room with blank paper, crayons and colored pencils, and feeling as if there was no limit to my imagination or where the story could go. 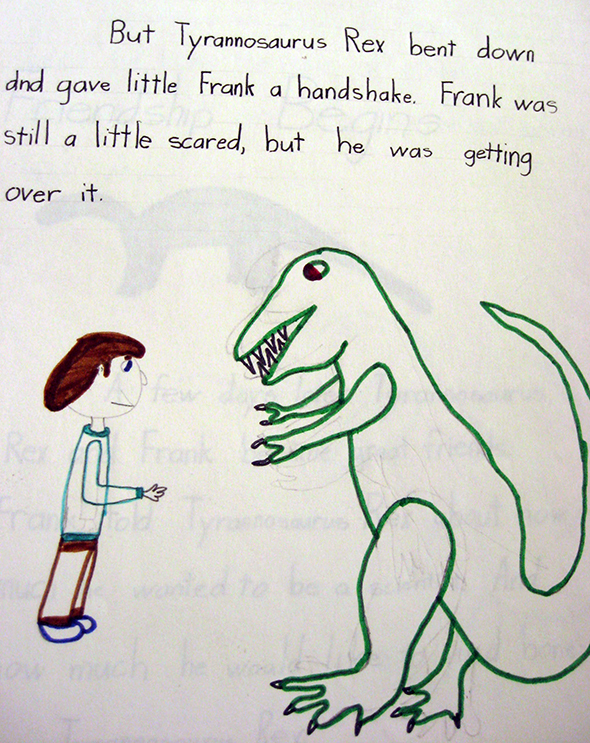 One of my stories involved a dinosaur: Tyrannosaurus Rex to be exact. I drew, and redrew, and redrew this tyrannosaurus rex over and over again. Each time, trying to get just the right shape of his head, his arms and his tail. I remember it just like it was yesterday.